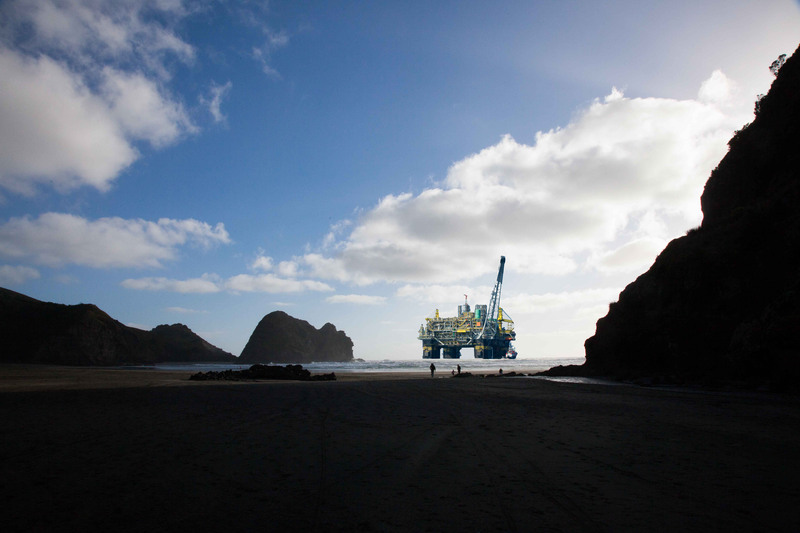 Oil rigs – coming to a beach near you? Home / climate change / Oil rigs – coming to a beach near you? The Government has recently engaged in consultation with Auckland Council about the granting of oil exploration permits in the area west of Auckland’s west coast beaches. But the Waitakere Ranges Local Board was not included in this consultation and you have to wonder about the advisability of drilling oil wells in an environmentally fragile yet stunningly beautiful part of Auckland. Exploration for oil has been in the news recently. The Government scheduled consultation with local government about the release of offshore petroleum exploration permits from September 20 until November 14, during the Local Government election campaign period and before newly elected Councils had settled down to work. Whatever the intention was the timing meant that the proposal was given less consideration than it should have. Council sustainability adviser Maria Ioannou, in a statement yesterday, said the decision was ”unexpected” and made public consultation more difficult. The Dunedin City Council and other councils had ”pointed out this makes it difficult for councils to make a democratic submission on an issue of significance”, she said. The department had launched consultation on the 2014 block offer, which sought to allocate petroleum exploration permits, but brought forward its own deadline for submissions from councils, iwi and hapu to November 14. Consultation during an earlier block offer in 2012 ran from November to January this year, and council staff had expected a similar time frame this time around, she said. Instead, they had been informed on September 18, the day before consultation started, that it would be conducted during local body elections and conclude on November 14. The Council adopted a principled position on the previous Block Offer release. In its written submission it highlighted the importance of community consultation, the need to localise any economic benefits, expressed concern at the potential risks and noted that the historical data relied on was not relevant to drilling in deeper more dangerous areas, and suggested that a ring fenced fund dedicated to mitigating and adapting to climate change should be established and paid for by the industry. [Deputy Mayor Vicki Buck] told fellow councillors this week the risks of deep-sea oil drilling off the Canterbury coast were unacceptably high. “The difficulty here is the risk is all ours, the profits are all the oil companies’,” Buck said. New Zealand had insufficient capacity to deal with a deep-sea oil spill. If one occurred, it could have a devastating effect, not only on the environment but also on Canterbury’s export-led economy, as it would tarnish the region’s reputation. “It is risk beyond what I think anybody would rationally take. We put the entire beach line at risk,” Buck said. Even if oil was found off the coast, it would not make the region self-sufficient in oil, as none of it could be refined at Marsden Point. “What is drilled here will be exported – we still end up at the bottom of any fuel supply chain,” the deputy mayor said. So how did Auckland Council handle this issue? Well firstly it did not announce that this consultation was happening. It did not even tell the Waitakere Ranges Local Board about the proposal despite the fact the Board’s area includes most of Auckland’s west coast and the pristine beaches of Whatipu, Karekare, Piha and Bethells Te Henga and even though the draft submission was discussed with Iwi. Its submission said there was insufficient time for consultation with local boards to happen but I do not know why we could not at least have been told about the consultation. Auckland Council’s submission expressed general support for the proposal although it requested that the 6 nautical mile exploration free zone from the coast be extended to 12 nautical miles. It proposed that any activities adhered to DOC’s guidelines for minimising acoustic disturbance to marine mammals and asked the Government to take action to ensure that risks of oil spills and other discharges are minimised, particularly in areas close to the coast. But in my view the submission could have been stronger, much stronger. There was only one vote against the proposal, that of Cathy Casey. Well done Cathy. So what could possibly go wrong with off shore drilling for oil? Shouldn’t we relish in the opportunity of us all becoming very rich? Unfortunately with New Zealand’s royalty and tax structures little local benefit is received. We do not have a regime like Norway or Venezuela where most of the benefit is retained locally. The environmental risks are significant and the proposed protective measures appear to be totally inadequate. The Deepwater Horizon Oil Spill in the Gulf of New Mexico shows how much damage can occur. And New Zealand does not have the same resources as the United States in handling these potential disasters. And most importantly if we as a civilisation are going to address climate change we need to leave some of the world’s oil in the ground. And what better oil to leave than the really expensive sort where if an accident did occur then our west coast beaches would be devastated.